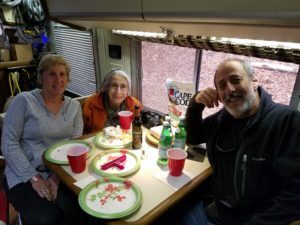 The Fountain of Youth must be in WashDC – Are We Where Yet?!! I am writing this in Cape May, NJ. We are here for a few days R&R after we spent a week in Washington DC, helping my Aunt get a new computer. Marilee is 104, and she uses her Mac every day to produce Artwork (she is a professional artist, who gave up bronze and ceramic when it became too heavy – at about 90). Her old Mac was becoming increasingly unreliable even as WiFi in various RV Parks was also…the latter preventing me from remotely fixing things on a more frequent basis. So we agreed it was time to replace it. I wanted to make sure we had enough time to make the new one as familiar to her as possible before we left…hit and run would not be appropriate. 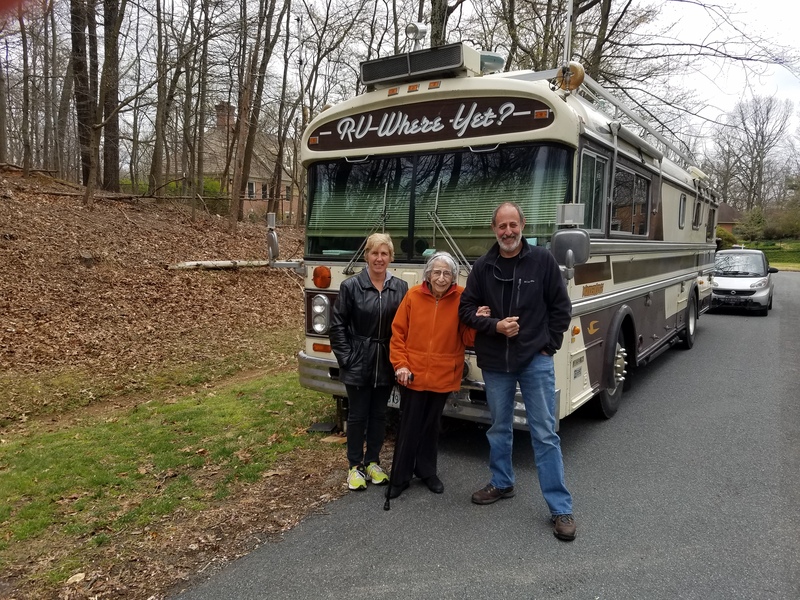 Parking the bus in DC turned out to be easy…because we parked it instead on the cul-de-sac outside friends Laurie and Paul Wilner’s Potomac, Maryland home while they offered us magnificent internal accommodations and company. The bus’ stay was uneventful on their sparsely-populated street in horse country, though I did get a call one day from an anonymous person; he wondered why this huge bus was parked on the cul-de-sac. (I always leave our phone number in the windshield as we’d prefer a call vs. police action). He did not identify himself, but Laurie was certain it was a particular, nosey neighbor. He may have been (justifiably?) concerned about squatters (vs. just plain nosey), so I assured him it was temporary while visiting his neighbors. He must have been satisfied as there was no further communication — and no police action! I wonder if the Apple Store “genius” tried to sell this 104 yr old lady the extended warranty… not really as predatory as it sounds… I am pretty sure Marilee will outlive the new Mac and all of us, too! Visiting Marilee in the District, the small parking-size of the Clown Car came in handy more than once. We drove down to Marilee’s for a couple days, where the new computer was implemented and all Marilee’s files and software moved. She also had a new camera to connect. Then we took a day or two off so she could work with the new computer and develop a list of issues. As of the end of the week, I think we had everything functional. 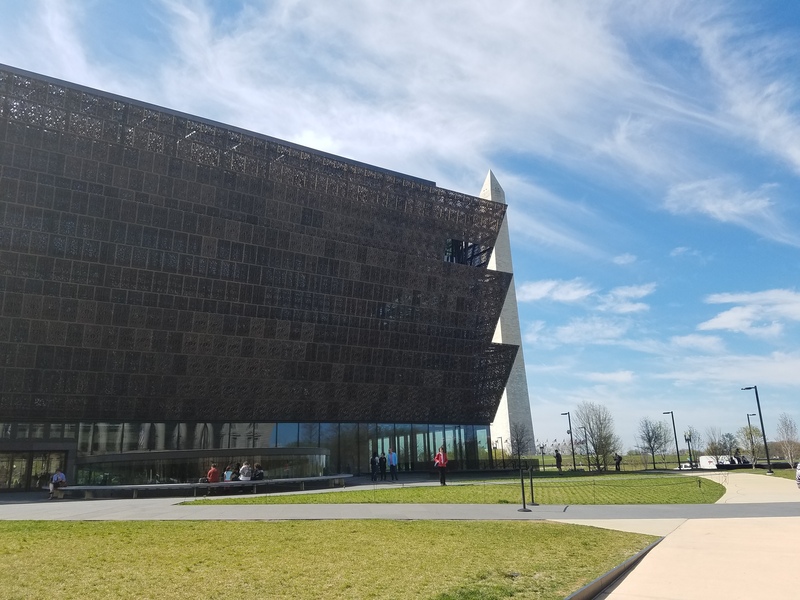 While in DC, we did a few of the more “usual” things one does as a tourist there. We visited the new Smithsonian Museum of African American History. Although a RICH and SPECTACULAR museum in terms of content and information, I have to say, we were a little disappointed. Perhaps it was the crowds, and perhaps they just need some time to refine the presentation. For example, there is a long gallery devoted to a timeline of African Slavery and the Slave Trade, Emancipation and Civil Rights. MUCH to read, and MANY video presentations including a lot of first-person narrative. The latter were projected onto exhibit screens from projectors mounted on the low-ish ceiling — projectors which the crowds walk in front of with no way to avoid doing so. Could not the curators have used flat screens and/or rear projection to avoid this obvious problem? Before leaving DC, we had Marilee over to “our Place” for lunch. This involved some orchestration, as the Clown Car seats only 2 (unless additional “passengers” are duct-taped to the roof). So one morning, I left Liz in Potomac and drove down to collect Marilee for a field trip. Arriving at the bus, we sort of “pushed” a bit to help her up the stairs. There we enjoyed “the best Grilled Cheese Ever” according to Marilee, and I suspect in her life she has a pretty broad level of experience in the matter! After DC, we planned Easter at Liz’s sister’s in New Jersey (just across from Manhattan), but we finished in WashDC a week early. 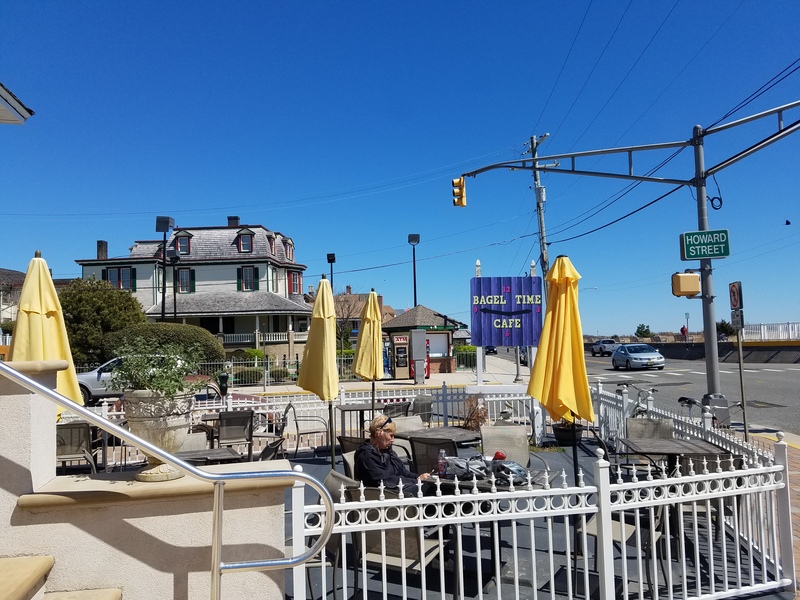 So we found a really nice little place to stop near Cape May and Wildwood on the Jersey Shore south of Atlantic City. 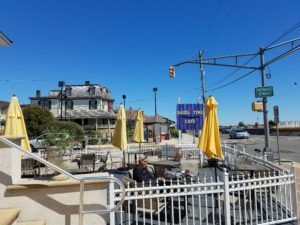 Cape May is a wonderful area. I can only imagine the difficulty in finding a spot for the bus there. But you did say “near”. There are a variety of really nice RV spots. Most of them not yet open yet. The one that was was also virtually empty. What fun! Still totally jealous!! Is that sister Ann in NJ? Hope they are well. Liz has such a nice, friendly family. Wish I had seen them more often. It was great having you both here and meeting your aunt. She is a true inspiration! Happy traveling!